The Game Rail Jam is a popular feature on the Rossland Winter Carnival and great for spectators and participants alike. With the Rossland Winter Carnival kicking off in just over a month, event organizers are busy with carnival planning and preparations. Previously it had been undecided if it was 1897 or 1898 when all the winter fun began at the first carnival. Now the committee has for once and all determined this important date in Rossland’s and Canada’s history. The Winter Carnival, which organizers say began in 1898, is Canada’s longest running winter carnival. “That is something new for this year,” explains carnival volunteer organizer, Larry Doell, of the agreement upon a date for the first Rossland Winter Carnival. The four-day program is full of activities for all ages. Event organizers have advised that the program includes a number of new and revitalized activities. The pyrophoria fireworks show is back, with music synchronized to the display ,held on Friday night. The Game Rail Jam, presented by Ross Vegas and Powderhound on Saturday, will be up-scaled. Visitors to the beer garden will be able to view the Sonny Samuelson bobsled hall of fame. Bobsled team winners from the previous five years along with their race times will be displayed. You will have to look twice at the carnival’s advertized dates of Jan 29 to Jan 32, 2015 and not be misled — this is a four day celebration. In the spirit of the carnival, organizers have published the final date as a continuation to the month of January for a bit of fun. “It makes people stop and think about it and then have a bit of a giggle,” said Doell. “The community spirit during the carnival is fully revved up, with the whole community getting involved”, explains Lisa Wegner, one of the carnival organizers. Whatever the weather, everyone is outside enjoying the carnival celebrations. Just think, a celebration of sliding down hills, doing it really fast and on almost anything you can imagine plus a parade, variety show, beer garden, an Olaus ice palace and much more. Long term volunteer Kelly Acheson, who began working with the carnival around 20 years ago, says she has enjoyed every moment of the carnival from the planning meetings to the actual events. “I have had a great time, I have never had a bad experience. John Heintz used to say ‘if you’re not having fun, don’t be here’. We’ve only ever had fun for as long as I can remember,” she said. Organisers are hoping for below zero temperatures with clear skies throughout the carnival so participants and visitors can enjoy everything there is to love about Rossland’s Winter Carnival. 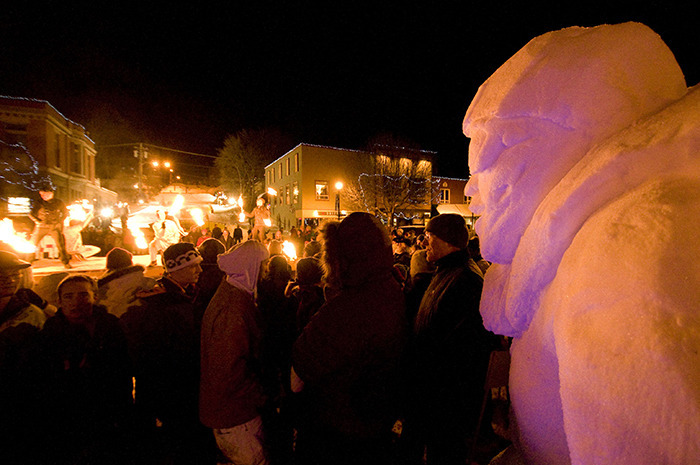 For further information and a full programme of events on Rossland’s Winter Carnival visit www.rosslandwintercarnival.com.